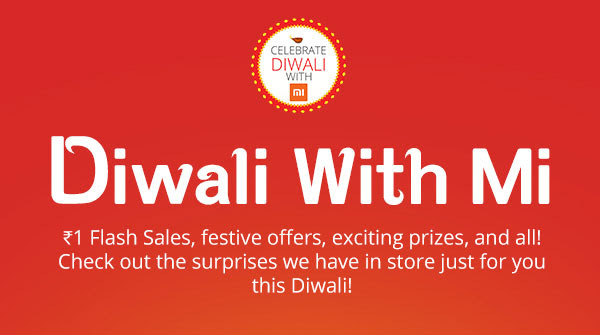 This will be Xiaomi’s first Diwali where it will use its own online portal instead of other e-commerce websites like Flipkart. The company is using the festive season to attract more users to Xiaomi’s own online store. The users who are interested in the sale will have to register on the online store as well as for the Re 1 flash sale. The user will have to share a post on Facebook or Twitter to book a “hot seat” for the sale. To get additional information and notifications, users can download the Mi Store app from Play Store. The registrations will close 2 hours prior to the flash sale. The Re 1 flash sale will be masked and users will not come to know which Mi product they are buying until it has been added to his cart. Also, warranty is not applicable for such products. Xiaomi will also host contests and give away coupons through games. Additionally, customers can also avail 5 per cent cashback, capped at Rs 500 from 10AM November 3 to midnight November 5. Xiaomi India has also announced offers through a game of drawing patterns on its website and the app. The prizes include discount coupons as well as Xiaomi products for free. Other than the Re 1 flash sale, Xiaomi will also offer a few smartphones on discounted prices. For now, the website indicates offers on Mi Pad, Redmi 2 Prime, Mi4 16GB, Mi4i 16GB but the offer price haven’t been disclosed. The website also offers the Mi band at Rs.799 and Mi in-ear headphones for Rs.299.